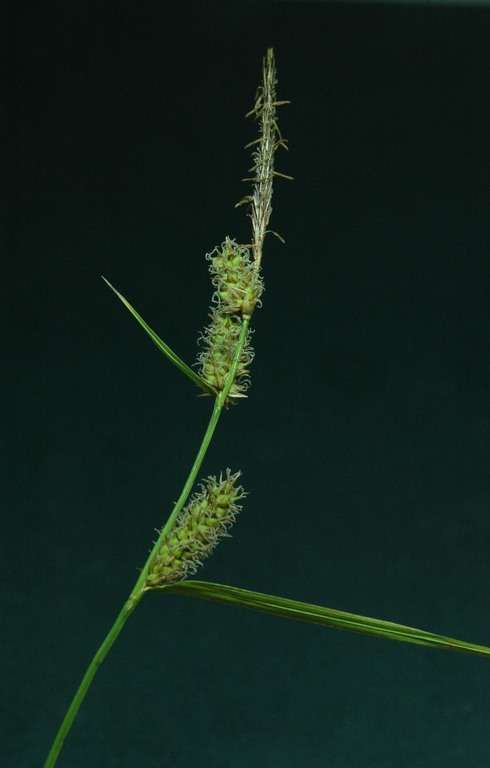 Carex pellita.Dean William Taylor.Creative Commons.calphotos.berkeley.edu (Accessed 4/2014). Carex pellita is a perennial sedge to 1 m tall, colonial from rhizomes, upper stem rough on margins, sharply 3-sided. Leaves alternate, bladeless at base of stem, blade length increasing up stem; stem leaves relatively flat, 0.2-0.5 cm wide, few, near base of stem; inflorescence bracts leafy, little or no sheath, the lowest often longer than the flowering stem. Flowers: male spike at top of stem, 2-5 cm long, often with a second male spike just below, female spikes 2-3, densely flowered 1-4 cm, narrowly cylindrical, about 0.5 cm wide, stalk short to none, rather far apart along stem, scales of perigynia partly or entirely brownish, narrow, short-awned, perigynia about 0.3 cm, densely short-hairy, egg-shaped, abruptly beaked, beak about 0.1 cm, 2-toothed, achene 3-sided, 3 stigmas; blooms and fruits May-Aug.
Habitat: Open marshes, wet meadows.